Stella Maris is a stunning 3 bedroom north facing penthouse apartment overlooking the length of Shelly Beach and east to the Pacific Ocean. Walking distance to The Belle General and Lighthouse Beach Cafe and patrolled surfing beach. Just a short drive to Ballina CBD, cinemas and restaurants. 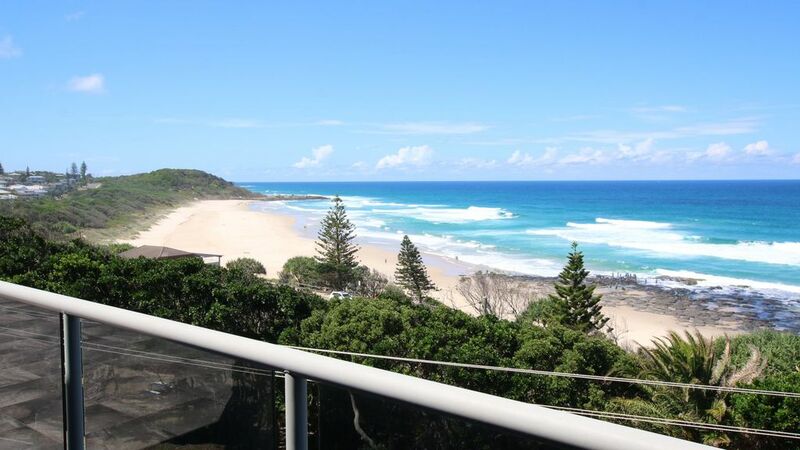 Large tiled balcony off lounge with stunning ocean views with Weber BBQ and outdoor dining. Carpet and tiles throughout. 1 Queen, 1 Double, 2 Singles. Dishwasher, 2 toilets, single remote garage & single carport. The apartment was lovely and suited us down to the ground. Spacious, a great deck and a family size table for evening get together's. Would definitely book again. Two things; an indoor floor brush would be good and we experienced some ants on the deck, perhaps some spray. Thanks Caroline for your review & the suggestions. Glad you had a lovely stay. Had a great week here and was impressed by the cleanliness, facilities and equipment. Although there is no aircon it wasn't necessary as with the windows open at night the ocean breeze blew through the windows. Stunning views and we watched dolphins in the surf most mornings. Great posi for both Lighthouse and Shelley beaches (both with guards) and the cafe nearby is excellent too. Stella Maris has magnificent, uninterrupted views of Shelley Beach from all living areas, two of the bedrooms and the huge deck. It is worth staying here just to wake up to see the dolphins playing at your doorstep every morning. The apartment itself is relatively modern with nice decor. The kitchen has a family sized fridge which was great. It is well appointed although some decent wine glasses, a hairdryer and cushions for the couch would be a welcome addition. The beds were really comfortable (firm but not hard). I thought we might be too hot in the apartment but with the fantastic sea breezes and the umbrella for the outdoor table we were fine. I've already recommended Stella Maris to friends. Thanks Amanda. Glad you had a lovely stay. Stella Maris was our base camp for a week, while we attended Byron Bluesfest. Very well appointed apartment, with all you need to stay very comfortably for a week. The view of the beach and ocean is outstanding, a real draw card to this place. The outdoor area is HUGE, and great for outdoor dining. Unfortunately, the electric awning is not available for tenant use, which makes the outdoor space a little less functional in hot weather. You're probably best to have a car to get around from this location into the main shops etc. The walk into the main shops in Ballina is over 30 mins. We spent hours sitting on the balcony watching the dolphins swim up and down the beach. Perfect place to relax a read a trashy book. Booking it through the agent was seamless, very helpful, quick to respond, and bond returned fast. Hope to stay again soon.